Recently, Davis Law Group, P.S., obtained recordings of 911 calls from the Dec. 18, 2017, Amtrak derailment. Attorney Chris Davis is representing multiple victims of the disaster. You can find several of the more noteworthy 911 calls HERE and HERE. An often-overlooked piece of evidence in accident cases, or any type of personal injury case, is recordings from 911 calls. Many inexperienced attorneys don't realize that these recordings are readily available and often easily obtainable. These recordings are public record, and made available by the federal Freedom of Information Act. There are certain requirements that need to be followed when making the requests, but the end is often worth the means for an attorney. 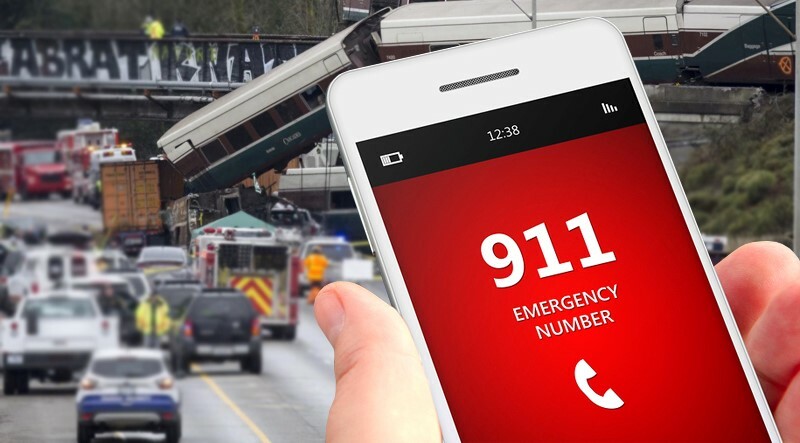 These 911 recordings can yield admissions from the negligent parties involved, provide crucial information from witnesses, and can help explain the severity of a collision. These things can really strengthen a case, especially one as newsworthy as the Amtrak derailment. Requesting these 911 calls – as well as a written transcript of the recordings – should be done as soon as possible. The right personal injury lawyer knows the exact steps to make sure the 911 calls, as well as other time-sensitive evidence, is secured. Calls to 911 are recorded, however they are destroyed after a relatively short period of time. A call to 911 could tell what was happening prior to, or just after an accident. Maintenance records: If your accident involved mass transit or a commercial vehicle, this could be a key to winning your case. If a defective or improperly maintained piece of equipment contributed to your accident, these records will be crucial to your case. Medical records: If any of the possible at-fault persons in your case were prescribed medication, or had a known medical condition, your attorney could use these records to strengthen your case. Cell phone records: These records may show that the defendant in your case was distracted at the time of the accident. Log books: These are particularly helpful in cases involving semi trucks. Drivers are subject to strict regulations, and any violation could establish fault and help you win your case. If you have been injured, it is important that you protect your rights by retaining the services of an experienced personal injury attorney. Loss of evidence could very well jeopardize your case. This is often overlooked by many who have been injured, and evidence is frequently lost by the time the victim has realized that they need to hire an attorney. Be careful not to let this happen to you or a loved one. Mr. Davis and his experienced legal team are working with the victims of the Amtrak derailment who are looking for fair compensation. Contact Davis Law Group today for a free case evaluation. Call us at (206) 727-4000, use the chat feature below or fill out the form on this page.